Help Finding the Perfect Motoryacht! Welcome to our Motor Yachts Buyer Knowledge Center – See our Customized Searches for Used Motor Yachts Worldwide! 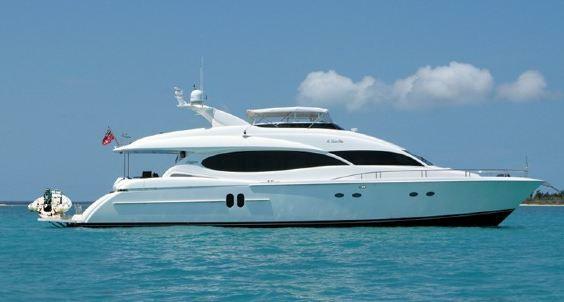 Motor yachts for sale are designed for volume, luxury and for living aboard in comfort. They are mostly equipped with diesel engines for the horsepower required to move heavier loads along with longer, more reliable engine life and fuel consumption. Smaller engines for extended range at slower speeds. Long Range Cruisers (or LRC) are designed for longer range and are equipped with more fuel capacity, smaller engines for better fuel economy and are built to handle rough sea conditions. Many North American cruisers are couples and thus value a yacht which 2 people can handle. Ideal features would include walk around decks for easier docking. Owner/operators working as a 2 person team can typically handle up and maintain up to around 70’ (21 m) size without crew. 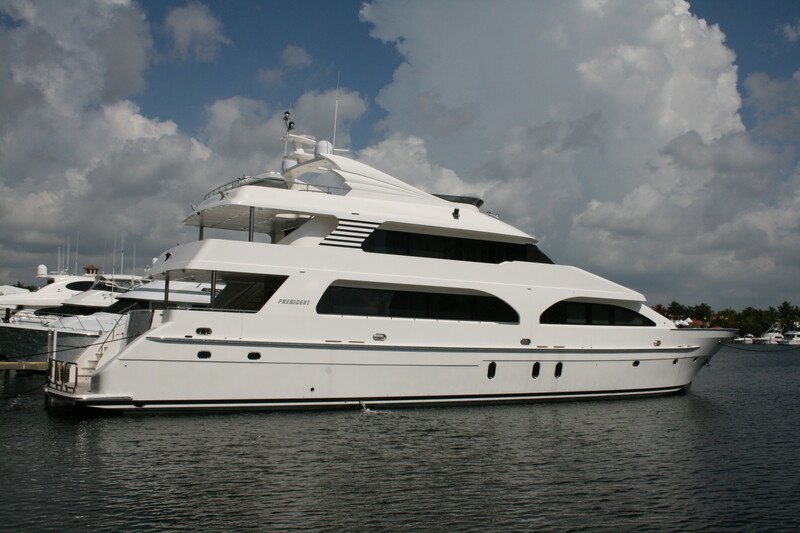 Many motor yachts for sale offer cockpits or “euro-transoms” making it easy to enjoy water sports. Cockpits offer the ability to sport fish and offer safe access to the swim platform. Euro transoms (twin stairways to a large swim platform) are also a popular feature for accessing the water. A euro transom also provides a large aft deck area and often a larger salon area. Wide-body designs (no walk-around side decks around the salon) maximize the interior salon space and offer a narrow walking ledge for use when docked or anchored. Larger motor yachts which require crew (especially when offering the yacht for charter) should include good living space for a happy crew. Many owners prefer a full beam master stateroom at the middle or the aft end of the yacht. These are the most stable and roomy areas of a yacht. Hull designs should be considered as well. 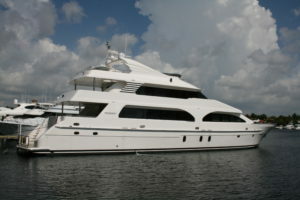 Fast motor yachts for sale are lighter in weight and offer planing hulls. These operate well going fast, but are considered ‘weekend’ boats. Displacement motor yachts for sale are limited to speeds of only 10-12 knots and offer more range. With the cost of fuel on the rise, many yacht owners are taking more time for travel in order to conserve fuel costs. Fiberglass (FRP) is the most common material. It is impervious to corrosion and is often built as a ‘sandwich’ or cored with a lighter material for weight reduction, sound reduction and improved performance. Aluminum offers the builder to be more flexible with custom styling. It is strong, yet light in weight and very durable. However, it is subject to corrosion and must be properly maintained. Steel is often used as a hull material for long range motor yachts and coupled with an aluminum superstructure. Steel hulls are very strong yet also must be diligently maintained. Gel coat is used with many fiberglass motor yachts for sale. Gelcoat is very durable and long lasting, but must be waxed often in hot climates to stay shiny. Paint is used for all types of construction with different types including hard paints such as Awl grip or softer paints such as Imron. Softer paints are easier to maintain and often last longer. Can we offer our expert services at no extra cost to you? Feel free to contact us anytime at (954) 889-7330 or email info@akyachts.com to share your thoughts and goals!